A&K¹s Travel Hot List for 2014! From the experts in luxury travel comes the eagerly anticipated Hot List for 2014. If it's a cultural sojourn you're after, a villa stay, a unique wildlife encounter or an active adventure there is something here for first time and seasoned traveller alike. "Staying ahead of the game is something we pride ourselves on", says Abercrombie & Kent Managing Director Sujata Raman. "Our travel specialists have been out and about experiencing and reviewing new and interesting additions to the luxury travel sphere both here and abroad. The result is the A&K Hot List. Read on for your next travel inspiration." Antarctica is the stuff of dreams and the quintessential once-in-a-lifetime adventure. Just getting there is an expedition in itself. A&K's chartered ship, MV Le Boreal, heads south from Ushuaia in Argentina crossing the Drake Passage to the wildlife-rich Antarctic Peninsula where penguins in their multitudes, seals, whales and icebergs make up the landscape. There are visits to working research stations and on some journeys a foray to the quaint Falkland Islands and South Georgia, remote British territories in the Atlantic. The season operates during our summer months so why not consider Christmas in the White Continent? Closer to home, the Berkeley River Lodge is the latest in eco luxury to open on Western Australia's Kimberley coast. Perfectly situated overlooking a pristine beach and dramatic red cliffs, access is by floatplane from Kununurra. Designer eco villas decorated in neutral tones feature splashes of colour, timber floors, open air bathrooms, private decks with sun-beds and glorious views - the perfect base for daily adventures. Dining is casual yet tasty with flavoursome menus making use of the finest quality ingredients. There are river and coastal cruises, beach and bush 4WD tours, fishing and guided walks. A heli-picnic or scenic flight to nearby waterfalls, ancient rock art sites and remote gorges is highly recommended. Located in the south of Chile, Chiloé is the country's second largest island and little known in the world of luxury travel. Positioned on the westernmost edge of the archipelago its landscape is rugged and, outside its two major towns, dwellings are few and far between. Fishing and subsistence farming are the major industries but it's also famous for its handicrafts and unique timber architecture. There are some 150 wooden churches there, many with World Heritage listings, and the colourful palafitos (stilted house over water) are dotted all around the archipelago. The only place to base yourself here is the brilliantly designed Refugia, a new 12-room lodge dramatically positioned on a hilltop, which you'll never want to leave. Lovers of iconic rail journeys will relish the addition of the Golden Eagle to A&K's portfolio. Russia's only fully en suite private train, it travels to some of the world's most remote and fascinating regions including Russia, Kazakhstan, Uzbekistan, Turkmenistan, Mongolia and China. The 10,600km Trans-Siberian journey travels for two weeks across Russia from Moscow to Vladivostok through eight time zones taking in incredible landscapes, unique cultures and a fascinating and varied historical context. Easily accessible to the luxury traveller, the Andhra Pradesh capital Hyderabad has surprising appeal. 400 years of history have left their mark with impressive ancient forts, a rich Mughal heritage alongside futuristic architecture and a thriving IT industry. Its cuisine is amongst the finest in India and there's no more glamorous place to bed down than the lavish Taj Falaknuma Palace. Restored to its former opulence over a ten-year period, the hotel glitters with Venetian chandeliers, grand marble staircases, gurgling fountains and priceless artefacts. Considered one of travel's final frontiers Madagascar is a country that offers unique cultural appeal, extraordinary landscapes and unique wildlife. Lemurs are the endemic primates of Madagascar with some 100 different species in existence. The Andasibe and Mantadia National Parks are two of the best for seeing the different varieties and the extraordinary baobab landscape of Ifotaka is a sight to behold. Dust, desert, souks and spices. Colourful and exotic it's home to a fusion of Berber, Arabic and Moorish cultures. There are boutique riads, chic hotels and Bedouin tented camps with adventure aplenty. The sedate leisure traveller will revel in the culture, cuisine and history while more active types can seek physical challenges in the form of hiking, horse riding or desert adventures. The beautiful island of Sicily has much to brag about. The largest island in the Mediterranean it has been at the crossroads of Europe and Africa for centuries and aside from its scenic diversity boasts a wealth of Greek temples and Norman churches plus archaeological sites and sandy beaches. Grand, historic hotels are the last word in elegance while the stylish cities are attractions all by themselves. It has an enviable climate year round and the cuisine is some of Italy's finest. As cruising continues its upward trajectory, the experts at A&K predict an upturn in small ship cruises across the globe. These tend to be more expeditionary in nature, with fewer passengers, sometimes educational yet also relaxing and culturally enlightening. Some of their favourites are the stylish vessels from Aqua Expeditions which journey on the Peruvian Amazon, the soon-to-be-launched Sanctuary Ananda on Myanmar's Ayeyarwady River and The Jahan which cruises the Mekong between Vietnam and Cambodia. Emerging from decades of civil war and rebuilding post-tsunami this idyllic island nation is one of the hottest destinations on the planet. There's something for everyone here with ancient cities, tea plantations and hill stations vying for attention with wildlife, temples and golden beaches. The people are warm and welcoming and it's easy to get around. Its culinary attractions are many and there are World Heritage sites and beautiful boutique hotels in abundance. Queenstown's modern Italian restaurant Sasso is offering food lovers a chance to learn the art of Italian cooking with Executive Chef Sal Grant. Grant presents "Cucina di Italia" – a series of cooking workshops that allows locals and tourists discover the skills and joy behind cooking authentic Italian cuisine. Starting fortnightly from July 10, the personalised workshops will be held throughout winter in the historic stone cottage on Queenstown's Church Street where Sasso (Italian for 'stone') is gloriously located. Grant has worked with New Zealand's finest Italian chefs – including Antonio Crisci of Waiheke Island Poderi Crisci, and Crisci's nephew Sergio Maglione, who owns Auckland's Toto. He also has a vast amount of experience in cooking demonstrations and is known as a warm and engaging presenter. "I'm passionate about sharing the love of food and I enjoy creating an environment in which people can learn," Grant says. "At the cooking workshops I'll demonstrate basic and new cooking techniques and discuss recipes. Participants will help prepare the meal and then enjoy it with exactly the right wine in a lovely environment." Using organic ingredients from Central Otago's finest growers, Grant will show participants how to cook a three-course Italian meal. There'll be the opportunity to get hands-on experience in the state-of-the-art kitchen and the food will be served and matched with wine from Sasso's extensive wine list. Participants will take home recipes of the prepared dishes and details of where the ingredients can be sourced. Cooking workshop numbers are limited to 10 people per workshop. Classes run every second Wednesday from July 10. The cost per person is $175. People need to reserve their space by calling Sasso on (03) 409 0994 or emailing info@sasso.co.nz. Sasso is Queenstown's number one Italian restaurant serving fresh, modern Italian cuisine. Centrally located in the historic stone McNeill's Cottage on Church Street, the elegant restaurant is just metres from the shore of Lake Wakatipu and boasts a Mediterranean-styled courtyard for all-year-round dining. Award-winning executive chef Sal Grant leads Sasso's state-of-the-art kitchen. Delicious, authentic Italian food on Sasso's extensive menu is created using local and Italian produce. From the world famous train journey to the glorious Inca citadel of Machu Picchu to mesmerising pageantry and cruising the majestic Amazon, Peru has been a magnet for adventurous travellers for generations. Yet while 5,000 years of ancient history and astonishing nature beckons at every turn, today this fascinating odyssey exploring South America’s most exotic destination can now be enjoyed in 5-star style. Luxury hotels are not only near historic monuments – they are part of them, or nestled amid breath-taking scenery once accessible only by arduous hike. In the capital of Latin cooking, Peru is the birthplace of exotic fusion cuisine, revealed to the world by legendary chef Nobu Matsuhisa, from a complex geographic and cultural diversity blending Spanish, indigenous, African and Asian influences with ingredients from the high Andes to the Amazonian jungle. With 5-star service and comfort amid a kaleidoscope of experiences arousing all five senses, Peru is a luxury travel destination like no other. The capital of Peru is not just a transit point; it is a destination in itself, a melting pot of the country’s gastronomy, culture, art, shopping, architecture and tradition. In the culinary capital of South America, Astrid & Gaston, Malabar and Central rank among the World’s 50 Best Restaurants. No fewer than seven Lima restaurants are rated among Latin America’s Top 15. The ancient capital is a treasure trove of historic architecture, from temples, squares and stately homes that shelter cultural centres and museums to important archaeological sites enhanced for tourism. Yet Lima is also a modern and cosmopolitan city, beating to a new pulse where the 21st century and Andean cultural traditions meet in an eclectic melting pot of nightlife, theatre, street food, music and exhibitions. Not even the Incas - supreme rulers of the Tahuantinsuyo - could ever have imagined the luxury of their most strategic Andean stronghold today. For Cusco, known by the ancients as the ‘navel of the world’ is a true first-class experience in one of South America’s most popular tourist destinations. Luxury hotels in historic monasteries and stately Spanish colonial homes; creative restaurants blending the best of Andean ingredients with the finest contemporary gastronomy; and gateway to glorious Machu Picchu and a ‘sacred valley’ – the capital of the Incas is all of this and more. Modern-day comfort is the norm these days on the stunning train journey up the Andes to the iconic Inca citadel of Machu Picchu, synonymous with Peru, aboard the luxury train "Hiram Bingham". Named after the tireless explorer who discovered the ruins a century ago, this replica of the Pullman trains from Europe’s ‘golden age’ of travel in the 1920s is a luxury experience for all the senses, from fine Peruvian dining to astonishing views of the landscape en route from an observation wagon. For a train journey along a track less travelled, the company also operates a luxury train from Cusco to Puno, known as the "Andean Explorer", on another journey recognised as one of the best train rides in the world. The ‘Sacred Valley’ of the Vilcanota River, the heartland of the Inca Empire near Cusco, today presents a different face, with first-class tourist services extending from rural tours and gastronomy to well-being spa treatments that leave an indelible mark on the traveler's memory. Imagine cruising the longest river on the planet aboard a floating 5-star hotel, voyaging from the source of the Amazon where the Ucayali and Marañon rivers meet, through one of South America’s most beautiful natural reserves, Pacaya-Samiria. The journey is topped with an exquisite gastronomic experience combining the best Amazonian ingredients, against a breathtaking jungle backdrop, viewed from the deck and panoramic cabin windows. It is a real life action film, or nature documentary, for your eyes only. You breakfast alongside pink dolphins, spend a lazy afternoon observing multicolored birds, with an ice-cold cold drink at hand. Through the balmy night, listen to the thousands of sounds of the jungle, or go on an outing in search of alligators in the black waters! Visit native shore communities to learn about the lifestyle of their gentle inhabitants, who live on fishing, hunting and small-scale farming, far from what we call civilisation. The valley of the Colca River, located at the foot of one of the deepest canyons in the world, is a magical place among the merry, traditional Collagua peoples, heirs to a rich culture famous for embroidery and extraordinary festivals. Here, you can also stroll around colonial villages rich in Andean baroque art, visit the temples of Yanque and Lari, and admire the charasmatic Andean condor - the King of the Mountains – in majestic flight. The hand of man has carved formidable cultivation terraces into the Andes, at Choquetico and Ocolle. Amid it all are unique luxury experiences: beautiful converted farmhouses with thermal spa waters in each room, Andean gastronomy, intense natural encounters, and environmentally friendly hotels and lodges. The scenic bay of Paracas, neighbouring a National Reserve beside the Pacific, is a seaside retreat of sophisticated accommodation and unique experiences penetrating secrets of both the sea and desert. Imagine sailing towards the Ballestas Islands in a luxury catamaran, with a glass of champagne; or staying overnight in a bespoke campsite set especially for you, amid mystical ancient drawings in the arid dessert; or windsurfing on one of the most breath-taking coasts in the world. The buffer zone of the Tambopata National Reserve in the south-eastern jungle of Peru offers the greatest of Amazonian diversity, in close harmony with environmental conservation. Explore scenic Sandoval Lake at dawn, encountering alligators and a myriad of native bird and animal species, and the vibrant pulse of the tropical rainforest. Beneath the rainforest canopy, discover fabulous plants and creatures along a jungle walkway. On return, relax in a hammock with a book, in the midst of absolute tranquillity, as the sun sets on a sparkling starry night. In many of Peru’s luxury hotels and lodges, spas constitute a core of the trip's experience. Their specialty is Andean treatments, massages, and relaxation and meditation techniques in serene well-being centres that embrace local traditions nurturing body and soul amid majestic vistas. The award winning 4.5 star Seabreeze Resort is the ultimate in boutique luxury. Gently nestled into a private secluded bay and hidden amongst coconut palms, discover the magic of this adults only resort. Re-opened in July 2011, this unique property provides the ideal romantic getaway for honeymooners and couples or those seeking luxury and intimacy. “Our dream was to create an oasis where guests can take a step back in time, where the pace is slow and the focus is on exquisite cuisine, personal service, and genuine Samoan hospitality. We want to make guests dreams come true”. Says Wendy Booth, owner, Seabreeze Resort. Winning accolades around the world since its re-opening Seabreeze has become one of the most sought after resorts for total exclusivity in Samoa. Seabreeze recently won the Leading Hotel in Samoa at the 2013 World Travel Awards and was named as Tripadvisors "Travellers’ Choice® 2013 Winner". Seabreeze was also voted as a TOP 10 resort in the South Pacific for "Romance & Value" and was awarded a further "Certificate of Excellence" in 2012 and 2013 from Tripadvisor.com. Seabreeze also won the 2012 New Zealand Restaurant Challenge and in 2013 won the award for "Best innovative design and technique” in the same competition. Seabreeze Resort is situated on Samoa's famous south east coast of Upolu, in the village of Aufaga, and is surrounded by some of the most picturesque tropical landscapes on Upolu. It is 50km from Faleolo International Airport and 35km away from Apia Township. Seabreeze's 11, spacious air-conditioned villas including the ultimate Honeymoon Point House, all have ocean, lagoon or reef views and are designed to provide guests with a sense of relaxation and tranquillity. With the focus on outdoor living, villas have been designed with a Samoan Flair and furnished and decorated by the best in interior design. Each villa features a private lava rock bathroom, outside deck and large thatched pavilion with outdoor furnishings and a cosy double hammock. With quality, innovative cuisine and outstanding customer service paramount, Seabreeze Resort offers three dining options. The Waterfront Bar & Restaurant serves a la carte breakfast, lunch and dinner and is situated right on the water with unsurpassed lagoon and reef views. Cbreeza Pizzeria serves genuine wood fire breads and pizza with Mediterranean flavours and a pacific flair and Paulini’s Pool Bar serves a variety of food and beverages pool side. From the time guests wake there is always something to experience at Seabreeze Resort. Relax by the infinity pool while enjoying cocktails, laze on the beach or take a dip within the protection of the pristine lagoon. Enjoy the use of complimentary glass bottom Kayaks and snorkelling equipment to view the beautiful coral and marine life or venture outside the resort for surfing, charter fishing, trekking, golf or visit a nearby beach, blow hole or cave pool. Seabreeze Resort has a recipe for relaxation, “when hungry you eat, when thirsty you drink, when tired you sleep and be pampered at every opportunity”. With this motto in mind, guests will be treated to a range of totally indulgent and nurturing massages and facials. With the focus on natural, age old techniques handed down through generations, guests will experience treatments unique to Seabreeze. At Seabreeze Resort romance is intrinsic to the spirit of the resort, so there is no better place to celebrating a wedding, honeymoon or special anniversary. Offering wedding programs from the simplest to the most elaborate of occasions, an experienced wedding coordinator will tailor a ceremony that not only meets individual needs but surpasses their expectations. Although wedding packages are available, Seabreeze believes no two weddings are exactly the same and will do anything to create the bride and grooms perfect wedding day. Trapped between the desiccating sands of the Namib and the freezing waters of the South Atlantic's Benguela current, Lüderitz is a fascinating old German town, full of character. There is only one road to Lüderitz, and bulldozers battle to keep it open through the shifting sands of the Namib. Meanwhile, on the coast, the beautiful buildings of this historic German town sit unchanged. 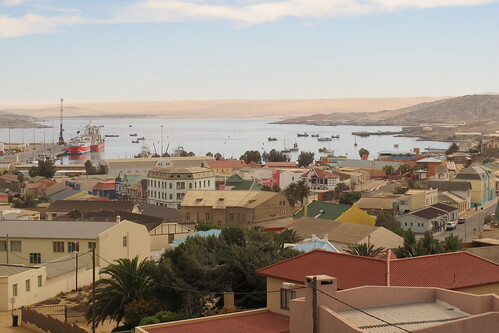 Lüderitz has an atmosphere all of its own: gentle, relaxed, some say sleepy. When the German colonial troops surrendered to the South African forces in 1915, a camp for the prisoners of war was set up a few kilometres outside what is now Aus, just off the C13 about 1km south of the B4. At one point 1,552 German POWs were held here by 600 guards. It seems that the German prisoners worked hard to make their conditions more comfortable by manufacturing bricks, building houses and stoves, and cultivating gardens. They eventually even sold bricks to their South African guards. The camp closed shortly after the end of the war, and little remains of the buildings bar a few ruined huts, although a memorial marks the spot. On a hill 1.3km to the east of town, however, is a small cemetery maintained by the Commonwealth War Graves Commission. Here lie 61 prisoners of war, and a further 60 members of the garrison, most of them victims of a flu epidemic in 1918. Archaeologists estimate that early Stone Age people inhabited the area around the Orange River at least 300,000 years ago, while the presence of rock art indicates that their descendants made their way inland. It wasn't until the 15th century that the first Europeans – Portuguese sailors – arrived here. Bartholomeu Diaz, the great Portuguese explorer was the first recorded European to visit Lüderitz in 1487. He erected a limestone cross at a point he named Angra Pequena or 'Little Bay' which is now known as Diaz Point. By the mid-1800's whalers, sealers, fishermen and guano collectors were gathering in the area and some had set up bases on the shores. In May 1883 a German trader, Adolf Lüderitz sailed up from Cape Town, landed at Angra Pequena and ventured inland to Bethanie. He struck a deal with the Nama kaptein Josef Fredericks to buy the bay and 8km around it for £100 and 200 rifles. Two weeks later another deal was struck for the sum of £100 and 60 rifles to extend the area to a 32km-wide coastal belt and the German flag was raised. By August 1884 Britain had agreed that Germany could found its first colony here. The town slowly grew and became a very important base for the German Schutztruppe during their war with the Nama people in 1904-07. The diamond boom started in 1908 when the first rough diamond was picked up. Deposits were found all over the coastal region and around Lüderitz which prompted the German colonial government to proclaim the Sperrgebiet or 'forbidden zone' to restrict further prospecting. The town became the base for the diamond mining operations, which became monopolised by Sir Ernest Oppenheimer's Consolidated Diamond Mines (CDM) after he obtained options on many of the German mining companies. This was the forerunner for the current NAMDEB which has a 50% government ownership. The headquarters of CDM was moved to Oranjemund in 1943 which started the decline of the town. Today tourism, fishing and some diamond diving are what keeps the town alive. Around the centre of town, houses are painted in improbable pastel shades, which makes Lüderitz feel like a delightful toy town at times. The air here is tangibly clean, even on the foggiest of mornings. Local Namibians say that Lüderitz can have all four seasons in a day, as the weather can change in hours from bright, hot and sunny, to strong winds, to dark, cold and foggy – and then back to sunshine again. This variation, together with a cold sea and the prevailing southwest wind, rule out Lüderitz as a beach destination, though brave souls still take brief dips from the beach near the Nest Hotel or round on the peninsula. In the evenings, there are a few lively bars, and a handful of quiet restaurants, notable for their seafood. But the entertainment here pales in comparison with Swakopmund. Because of its location, Lüderitz is not somewhere to 'drop in on' as you need to make a special journey to come here – but it's worth visiting for its architecture, its peninsula, and to see a part of Namibia which seems almost unaware of the outside world.. If you choose to visit the area, allow a minimum of two nights to appreciate it, and to see its surrounds properly. Try to avoid Sundays and public holidays, though, when almost everything closes down, and the town is empty. Tourism is having an impact here, but only gradually. Although several new hotels and guesthouses opened their doors in the years following independence, there's a marked downturn in the town's economy, offset only partly by visiting cruise ships. Even the trendy new waterfront development near the harbour is looking a little tired. On the plus side, use of the harbour as the export base for the Skorpion zinc mine near Rosh Pinah has brought considerable new business into the town. Investment in the town's infrastructure is also ongoing, with plans to develop the old power station near the Nest Hotel – including a maritime museum, craft market and sports facilities – finally coming to fruition. Kolmanskop, or 'Kolman's hill', was originally a small hill named after a delivery rider, Kolman, who used to rest his horses there. In April 1908, Zacharias Lewala was working nearby when he picked a rough diamond from the ground. He took this to his German foreman, August Stauch, who posted a claim to the area, and then got the backing of several of the railway's directors to start prospecting. Stauch exhibited some of his finds in June 1908, prompting an immediate response: virtually everybody who could rushed into the desert to look for diamonds. Famously, in some places they could be picked up by the handful in the moonlight. This first large deposit at Kolmanskop lay in the gravel of a dry riverbed, so soon a mine and a boomtown developed there. Deposits were found all over the coastal region, all around Lüderitz. Quickly, in September 1908, the German colonial government proclaimed a Sperrgebiet – a forbidden zone – to restrict further prospecting, and to license what was already happening. Between 1908 and the start of World War I over 5 million carats of diamonds were found, but the war disrupted production badly. At the end of it Sir Ernest Oppenheimer obtained options on many of the German mining companies for South Africa's huge Anglo American Corporation, joining ten of them into Consolidated Diamond Mines (CDM) of South West Africa. In 1922–23 CDM obtained exclusive diamond rights for 50 years over a coastal belt 95km wide, stretching 350km north of the Orange River, from the new South African administrators of South West Africa. These were later extended to the year 2010, allowing NAMDEB to control the country's diamond production for 20 years following independence. Although these rights have now theoretically lapsed, the government is a 50% shareholder in the business, and little has changed. Meanwhile many small towns like Kolmanskop were flush with money. It had a butcher's, a baker's and a general shop; a large theatre, community hall and school; factories for furniture, ice, lemonade and soda water; a hospital with the region's first X-ray machine; comfortable staff quarters, elaborate homes for the managers – and a seawater pool fed by water pumped from 35km away. Yet Kolmanskop was fortunate: it was next to the main railway line. Often deposits were less accessible, far from water or transport – and many such early mines still lie half-buried in the Namib. Lack of human intervention within most of the Sperrgebiet for almost a century has left a remarkable diversity of wildlife. Plants, in particular, have thrived, with over a thousand species identified: almost a quarter of Namibia's total, qualifying the Sperrgebiet as one of the world's top 34 biodiversity hotspots. Many of these are succulents that bring bursts of colour to the desert during the rainy season. A total of 215 bird species have been identified within the park as a whole, many of them congregating at its southern edge, in the wetlands at the mouth of the Orange River. The authorities claim that 80 mammals live within the park confines, including the solitary brown hyena, and a further 38 marine mammals off shore. Azamara Club Cruises opened reservations on its 2015 program that includes the line's first voyages in Australia. The 2015 lineup is composed of 52 five- to 18-night itineraries that will visit 203 ports in 62 countries. 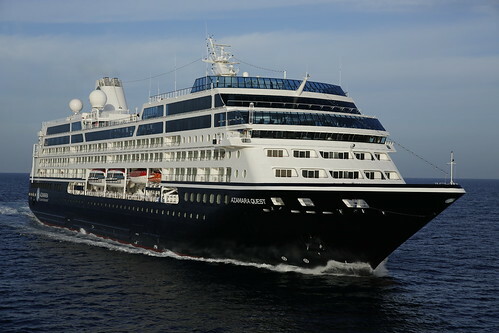 The Azamara Quest will sail Asia voyages in the spring and winter seasons. In late December, Azamara Quest will sail from the Bali Sea on a 14-night holiday and New Year's voyage to Australia and the Great Barrier Reef. The ship will make maiden calls at Puerto Princesa, Philippines, and Thursday Island and Darwin, Australia, as well as at Great Barrier Reef destinations Cooktown, Port Douglas and Cairns, Australia. In spring 2015, Azamara Journey will sail 11- to 18-night voyages throughout Brazil, Uruguay and Argentina, the Antarctic Sound, Panama Canal and West Indian islands. One voyage overnights at Rio de Janeiro during Carnival, and Azamara offers for sale seating in the stands of the sambadrome for the samba school competition. Azamara Quest will sail the Baltic, North and Mediterranean seas on seven- to 18-night itineraries while Azamara Journey will explore the Spanish, French and Italian rivieras, the Adriatic and Black seas, and Greek Isles on seven- to 16-night itineraries.